Living as an expat means there are lots of different people you get to meet, and some of the coolest people I’ve gotten to talk to are third-culture kids, or TCKs. This week I was really excited to have the chance to talk to Noah, a friend of mine who’s grown up overseas and getting ready to move to the US for university, but I’ll let him share the rest of his story. Noah, thanks for taking the time to share about your experiences. To start us off, I think there’s the baseline question of what even makes someone a TCK? A TCK is someone who has been raised in a culture other than the culture of their parents. So if you grew up in China but your parents are from America you would be a TCK. You live in one culture at home, your parents culture, but outside you live in the culture of the country you are living in. You personally begin to form your own culture, made up of a mix of the two plus that of your friends’ home cultures. So what’s your TCK story? I was born in America, in Devils Lake, North Dakota. I lived there for nine years before I became a TCK. 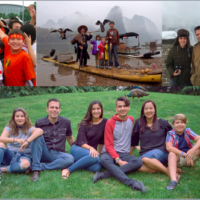 In May 2008 my family and I moved to Xi’an China (This week is ten years in China!). We were there for a couple years before we moved to Nanning (in Guang Xi Zhuang Autonomous Region) and then back to the states for a year in 2012. In 2013 we came back to Nanning and then in early 2014 we ended up here in Beijing. Wow, 10 years! Since you’ve been here for basically half of your life, how have you come to view the idea of a home country? For me personally, I am comfortable with the fact that I don’t just have one home country, that China and America are my home. I also realize that while I am a US citizen I am also a citizen of God’s kingdom and that is what truly matters. With that it doesn’t matter what country or what culture I am in. I can always be grounded in that, whether I am in the US, in China, or anywhere else. I am always part of the people of God and that is the culture that I bring and can be a part of no matter where I am. Yeah, that is definitely such an important perspective to have that our true citizenship lies beyond Earth. Nonetheless, there is still a going back and forth between the places you view as home. What are some of the difficulties when you “go back” to your home country? I have only actually been back to my home country three times, and when I have, it has been really good. Since I was already nine years old when I moved to China I still have some friends in the States who I can go spend time with. The highlight, though, is always seeing family. The most difficult part of being back in the States I find is that I begin to miss my home. Since I live in China, and have spent half my life here, I sometimes feel like when I go to the States I am just visiting rather than returning home. I am glad that I got to go back to the states for my eighth grade year, during that time I was able to be a part of my home culture, and without that time I think going back now would be a very different experience. I’ve often heard from TCKs that some of the more difficult interactions going “back” to your home country come from questions people there ask. What are some of the common questions you get asked and which ones are the most difficult to answer? What language do you speak at home? Do you miss home? Where are you from? I think the most difficult question for most TCKs is “where are you from?” Having grown up in multiple places it can sometimes be difficult to really say where we are from. While many people expect us to say the country our parents are from, it’s hard to say that when we feel little real connection to that “home country.” If we say the country we are living in, people will be confused because they can see that we are obviously different. For me it is just easier to just say “I was born in . . .” it leaves little to question. While some people ask these difficult questions, I’m sure there are people who simply don’t even engage with the life experiences you’ve had as a TCK. Do you ever feel lonely when people don’t even ask about your story? TCKs, like anyone else, would love to share about their life with you. Many of the times we try, people that we are sharing with cannot even place the information we are sharing. I think one way people could do better is just to try to imagine what its like being in a place foreign to you and coming back and nobody understanding. Ask us questions, get to know us, I’m sure we will both learn a lot! Well, here’s hopefully one of those questions! Ha! What are some things you wish non-TCKs would better understand about your life experiences? Being a pastor’s kid, sometimes people ask me, “so what’s it like being a pastor’s kid?” I have always struggled with answering this question since I have always been a pastor’s kid, I don’t really know what it’s like not to be one. It’s similar with being a TCK. Even though I wasn’t a TCK till I was nine, the majority of my memory is from my time in China. We aren’t really that different from non-TCKs; we’ve just lived in a different place and had a few different experiences. This may be one of those questions that’s hard to answer without another point of reference, but how do you think your experience as a TCK has shaped you? I definitely don’t think I would be who I am today without my experiences as a TCK. I think one way growing up as a TCK has shaped me is just in my understanding of different cultures and in giving me a broader perspective than a typical person my age. I think it has also given me a real appreciation for family. When you’re new and outside of the culture you really feel like an outsider. It is really comforting to be with family and I think it has probably helped our family be as close as we are. That’s really cool. In addition to the appreciation for your family, what are some of your favorite parts of growing up overseas? Being able to travel. Travel is just a part of what it means to be a TCK. Getting to go visit your home country, taking visa trips. There are many opportunities to travel, experience more cultures, and meet new people. I am grateful that I am able to be more international in a world that is growing more and more connected. Now, after almost half of your life in China, you’re heading to the US for the next few years. What are some of the challenges you anticipate facing when repatriating for university? What are the things that excite you the most? It’s hard to say until I actually get there, but I’m guessing that a lot of the challenges I will face will be similar to any person going off to university. I will still be missing my family, and other things related with living away from home. One thing that I think may be tough is not having the same kind of community that there is here in Beijing. Being here in an expat community really is something special and has its own culture. While I am American, I still think I will experience reverse culture shock on some level moving back to the States. I can definitely agree that we have a great community here. For most expats, we’ll be constantly coming into a fair amount of contact with TCKs, so to round off this conversation, how can those who interact with TCKs better engage with your demographic? People are generally great at interacting with TCKs, at least I haven’t had a problem. Most of the people I interact with are people who are also living in a culture outside their own, so for many expats, it is a very similar experience I think. I guess just keep being real. Try to ask good questions. Remember that we really are normal. You can act with us like you would with others. Well, Noah, thank you again for this really great conversation. I know it’s provided me with lots of insight into the experiences and life of a TCK and now I have some new things to keep in mind as I engage with other TCKs. Best of luck at university this fall, and Beijing will miss you! Do you have any thoughts or questions on life as a TCK? Post in the comments below and we’d love to get back to you!